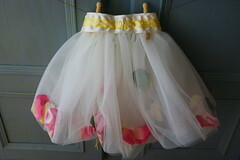 ..custom made for a wee little flower girl. you are rockin the tutu girlie! love them!!! wish my girls were a bit smaller to wear them! I'm thinking if I get married one day, I may just wear one of these down the aisle!